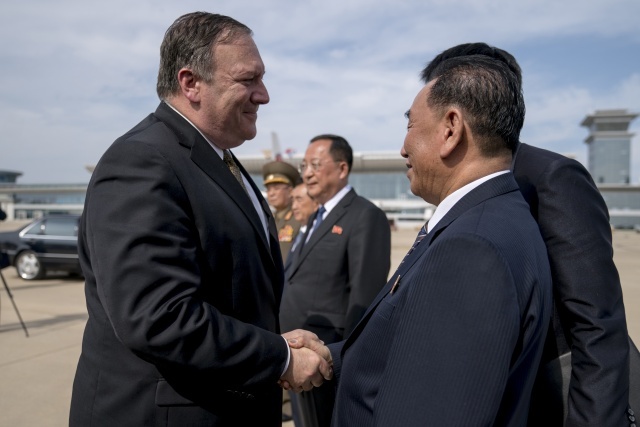 (FILES) In this file photo taken on July 7, 2018 US Secretary of State Mike Pompeo says goodbye to Kim Yong Chol (R), North Korean senior ruling party official and former intelligence chief, before boarding his plane at Sunan International Airport in Pyongyang. US Secretary of State Mike Pompeo said November 4, 2018 he will meet this week in New York with North Korea's number two, Kim Yong Chol, to resume denuclearization talks. (AFP) - The United States is delaying approval of several requests for sanctions exemptions to deliver tractors, spare parts and other goods needed for humanitarian relief in North Korea, according to documents seen by AFP on Thursday.